Crepes are simply delicious. The filling is what makes them. For the ones featured today I thickened the juice from a jar of sour cherries and added fresh cut strawberries, raspberries and vanilla bean ice cream. Top with sweetened whipped cream and a drizzle of chocolate sauce. Beat eggs, and add in remaining ingredients. Beat well until you have a smooth batter. Using a 1/3 cup measuring cup scoop batter and pour into middle of pan. Twirl pan so the batter spreads out into a thin round. Allow to cook on first side for a few minutes. Gently flip and cook on second side for about 30 seconds. Remove to a cooling rack. Once cooled stack between wax or parchment paper until ready to fill and serve. Drain the cherries and put the juice into a microwavable bowl. Whisk the cornstarch into the juice and microwave until the juice bubbles and there is not more 'chalky' taste from the cornstarch. This will take about 5-7 minutes. Stir several times between. Pit cherries if they are not already. Add to the thickened juice. Set mixture aside to cool. This can be done ahead of time and put in refrigerator. This is also nice served slightly warm, but not hot. Ohhhh ... yum !!!! definitely a fav of mine! Oh my goodness that looks yummy! 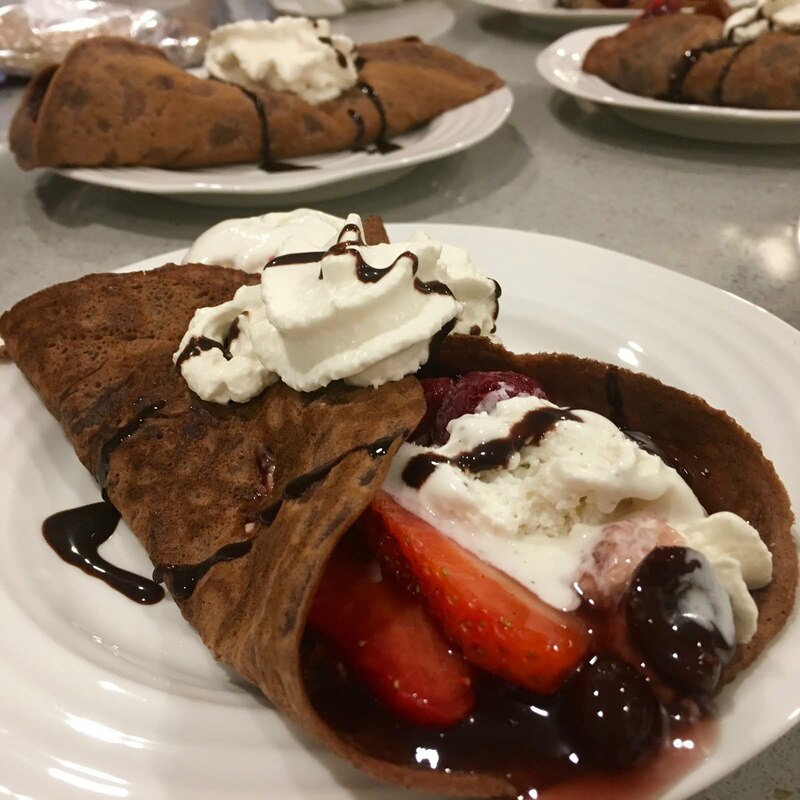 Chocolate crepes - what's not to love?